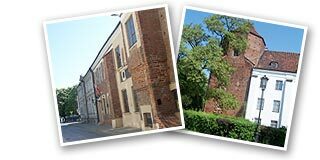 The idea of this website is quite simple - a list and a brief description of all hotels in the town of Płock. Travelling across Poland I always face the problem of choosing the hotel. Even if I manage to find the website containing the list of hotels it is lacking any descriptions - I must choose at guess. I hope this site will help You to choose the hotel and You will have a wonderful time in Płock. Płock is a town located in Masovia Province over the Vistula river 738 km from its source and 319 km from the mouth. Płock is situated over 8 km wide Vistula valley, in the range of reservoir created by Włocławek dam, on the border of two regions: right-bank Dobrzyńskie Lake District and left-bank Płock Valley. The local climate is characterized by the lowest annual fall (500 mm yearly) and the average temperatures of January -4 and June +18°C. The town occupies 8 805 ha along with 131 011 inhabitants (1999). The main part of the town is situated on the high, righ bank of the Vistula River (around 50 m high hill), and the left-bank Płock is Radziwie district. The colors of Płock: yellow and blue with the red stripe in the middle were established in 1938 by the Town Council with the colors referring to the old-time province uniform settled by Polish Parliament on 1776 for Płock Province. Probably the oldest and the largest hotel in the town. Recently it has been overhauled. The Orbis brand guarantees a high standard of services. Situated in the exact centre of Płock, around 10 min. away from Old Town by walk. A very nice hotel located in the heart of Old Town. There is a breathtaking view of the Vistula Valley from restaurant and rooms windows - one of the most beautiful sunsets I have ever seen. Definitely the best and the most luxurious of all. However, there is a snag: it is 10 min. by car from Płock - it lies in woods and just on the lake shore. A perfect one for team-building, conferences and other parties. Located over the same lake as "Dębowa Góra". A bit cheaper and less luxurious, and has the same drawback - it is inconvenient without a car. A former lodging-house for Petrochemia Chemical Factory employees. Recently restored and converted to a hotel. Unfortunately, situated in fairly nice quarter of Płock, around 15 min. by walk from Old Town. The advantage is a neighborhood of P. Włodkowic Univeristy College and Warsaw Institute of Technology. However, the price is a bit too high. Located in the town centre, just beside busy crossroads and not very far from "Petropol", around 10 min. from Old Town. Although the quality is lower then above hotels, the price is definitely attractive. We find it just over the river bank, at the foot of Tumskie Hill - 5 min. by walk from Old Town, but, which is important, one must climb the hill to get there. It is quite nice place, so if "Starzyński "is too expensive "Rybaki Inn" will be the perfect one. It takes 10-15 min. by car to reach the town centre from there. The hotel is located in the quarter which has been joint to Płock recently. Rather not suitable for romantic weekend for a couple, but it seems to be an interesting alternative for a low-cost business-trip. The foregoing content is not a formal offer in the eyes of the Polish Law. All comments are subjective opinions of the Author - have you any remarks or proposals feel free to e-mail us: hotels@plock.org.pl. We kindly request You to send us any remarks (either positive or negative) regarding visiting mentioned above hotels.